It's slightly quirky, but Big Blue Limiter gives easy access to a range of warm and tasty tones. Delivers warmth and punch. Brings out hidden details. Compare button. Separate Drive function. 'Marmite' interface. Lookahead strangely implemented. The Redline range of plug-ins from 112dB has greatly impressed us, racking up a bunch of high-scoring reviews. Now it seems that the company have got the blues, as they kick off a new range with Big Blue Limiter (BBL). This isn't another transparent brickwall limiter for making your mixes ear-bleedingly loud without drastically altering their sonics, though. Rather, the BBL is designed to add warmth and is modelled after vintage tube characteristics. It's hard not to notice the, err, 'eccentric' colour scheme - gold, yellow and blue won't be to everyone's taste. For those who can't stomach it, fret not, as 112dB is already working on an alternative 'modern' skin. Running through the controls, there are sliders for threshold and output levels, and accompanying metering. Dual VU-style meters in the centre of the GUI show gain reduction for the left and right channels, while the 'cat's eye' indicates how much 'character' is being imparted - basically, the amount of saturation. Using the Knee knob, you can adjust the curve of the BBL's limiting response, and you can shape the response further with the Release control. There's no Attack control, which is understandable for a limiter, but you can set the lookahead. Big Blue Limiter features variable lookahead, controlled by a knob at the bottom left of the GUI. Lookahead is a technique used by many dynamics plug-ins, and it means the limiter plug-in is looking in advance at the incoming audio so it can react to peaks before they occur. How? The audible signal is delayed while the signal feeding the unit's sidechain is passed through undelayed. While most plug-ins do this by having a fixed latency, BBL actually adjusts its reported latency as you tweak the knob, down to a minimum of six samples. Higher values reduce the risk of sudden transients popping through. The Drive control lets you push the input stage harder, adding more harmonics. The results of this are different to simply lowering the threshold, and if you want more grunge, grind and grit, 112dB advise using a trim plug-in before BBL to boost the incoming audio level. The Compare button matches the output level to that of the input, allowing a fair comparison between the bypassed and effected signals. Because a louder signal almost always sounds 'better' than a quieter one, level-matched comparisons are essential when trying to assess whether an effect is really improving a sound and not just making it louder. The only downside is that BBL's compare function doesn't take into account the level-boosting drive setting, but hopefully this can be amended in an update. Other niceties include MIDI control and stereo linking. Dropped in a mix, BBL is immediately pleasing to the ear. In many situations, it's less harsh than standard digital limiters, and it stays musical, even at extreme settings. Using the drive control can really heat things up, generating punch and overdrive without ruining the sound - quite a balancing act. BBL achieves great results and is suitable for both subtly enhancing and seriously spicing up source material such as vocals or drum loops. In fact, it's worth a go on all types of busses: drums, synths, you name it. It imparts a little too much warmth to be a general-purpose mastering tool, but for some mixes, it can supply that missing oomph. 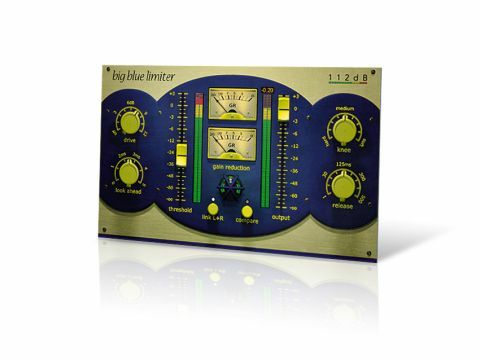 The simple operation and good sonics make Big Blue Limiter a genuinely useful addition to anyone's mixing toolkit.